Kinoton Korea recently equipped Incheon SK Happy Dream Stadium with a complete networked sound reinforcement system by Harman Professional Solutions. Built in 2001, SK Happy Dream Stadium plays host to home games by SK Wyverns, a professional baseball team based in Incheon, South Korea. As part of a continuous effort to improve the stadium, which seats 25,000 fans, the stadium recently decided to upgrade its aging sound system. 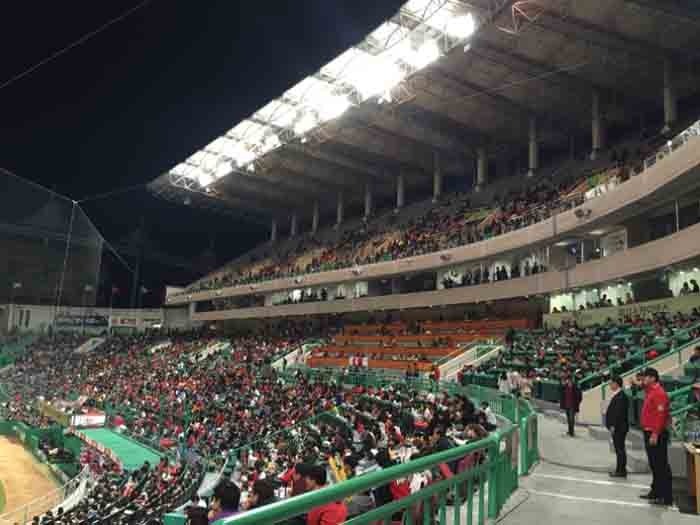 In order to provide fans with a rich audio experience with superior coverage and intelligibility, SK Wyverns hired local audio integrator Kinoton Korea to design and install a premium sound reinforcement system. Kinoton Korea selected a complete Harman networked audio solution for its industry-leading sound quality and reliable performance. The Harman system features a range of weather-resistant JBL Professional speakers distributed throughout the stadium, including 54 AM7215/95 WRX, 16 AW595, nine ASB7128 WRX, 37 AC26 WRX, 39 Control 26CT and 15 Control 25AV speakers, the entire speaker system is powered by Crown DriveCore Install Series amplifiers. In the control room, microphone and playback signals are mixed using a Soundcraft Vi1 Series mixer, while two JBL LSR305 speakers provide accurate monitoring. Kinoton designed the entire system around a BSS Soundweb London BLU-800 signal processor and two BLU-320 expanders, providing the foundation of the custom Harman solution. Additionally, six Soundweb London BLU-BOB2 break-out boxes each offer eight channels of analog audio output expansion via the high bandwidth, fault tolerant digital audio bus. Finally, six BSS MC-1 fibre optic media converters provide signal transport over extremely long distances (up to 6.2 miles) using a single cable. MC-1 devices utilise automatic link restoration which re-establishes network links between two devices when any Soundweb London device is disconnected or restarted.